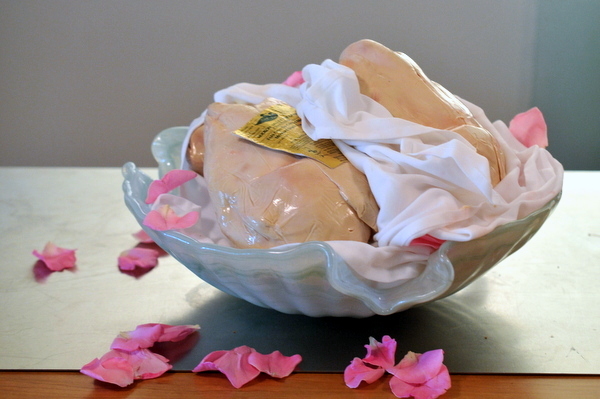 Set to go into effect on July 1, the ban on the production and sale of foie gras in California might not actually impact consumption in California, but it seemed wrong to let the date pass without some sort of commemoration. 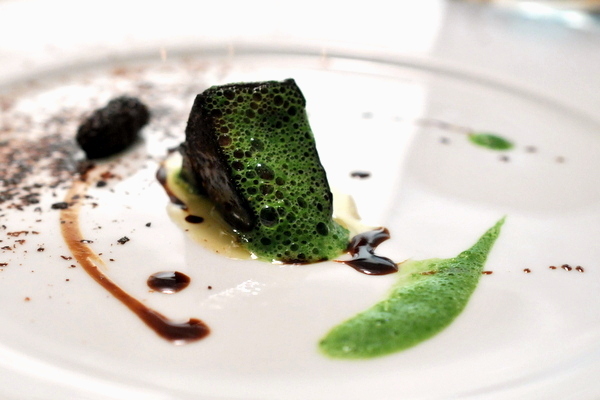 Wanting to go out with a bang, we opted for a special 30-course menu from The Royce's Chef David Feau. A bowl with three lobes of foie gras was waiting on ice at our table and I found myself sincerely hoping we weren't going to eat all of it. Naturally such a dinner calls for plenty of wine and The Royce's sommelier, Eric Espuny, did a tremendous job with the pairings. Knowing palate fatigue would be a factor with 30 courses, he designed a program around uncomplicated wines that still paired well with the food. 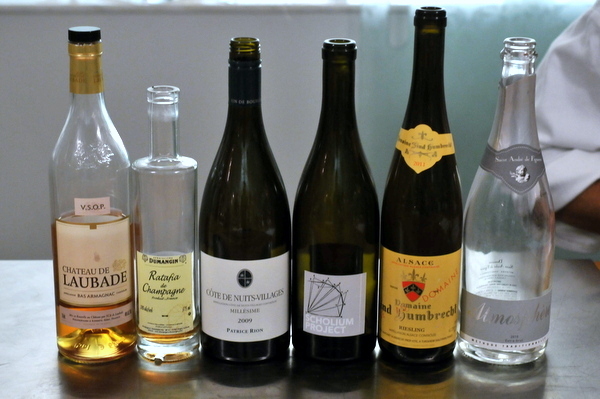 I appreciated the fact that Eric didn't simply take the easy way out by simply pairing sweet wines since that would have been too heavy especially later in the meal. The meal began with a set of canapes to share though they were so good that I wanted to keep them all to myself. Begining with the croque-en-bouche, a traditional French dessert, the foie filling gives the airy choux pastry a lovely savor while the sugary crust harkens to the morsel's sugary origins. 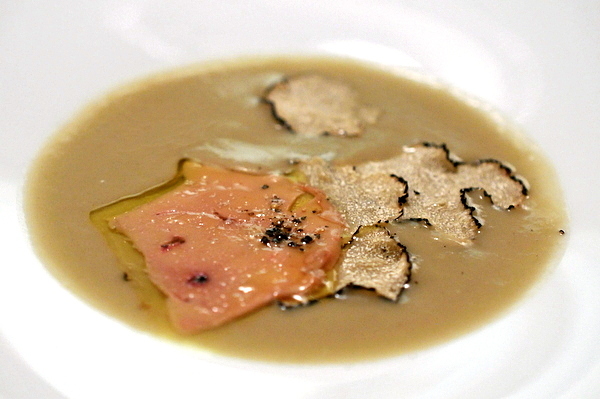 Hard to complain about foie and truffles, the bits of crumbled truffle convey an earthy musk in perfect harmony with the nutty arugula and rich creamy torchon. 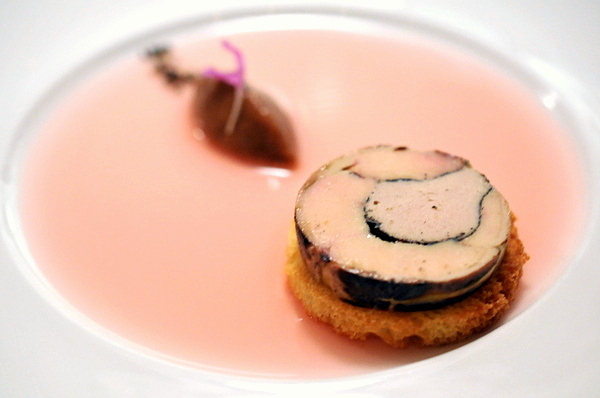 The simple "foie sushi" might be my favorite of the quartet, an unrestrained aroma of salinity hits the senses a second before the weight of the liver leaving a sublime contrast lingering on the palate. The last of our introductory bites consisted of a prune filled with a creamy foie gras mousse, Feau uses Armagnac to add a twist to the classic ripe fruit and foie combo.Rather than a welcoming reception in the wine room, Espuny opted to open a couple bottles of Rosé at the table, though made in the classical methode champenoise but displays intense notes of soft grapefruit, a delightful start to the meal that would carry us through the first few courses. 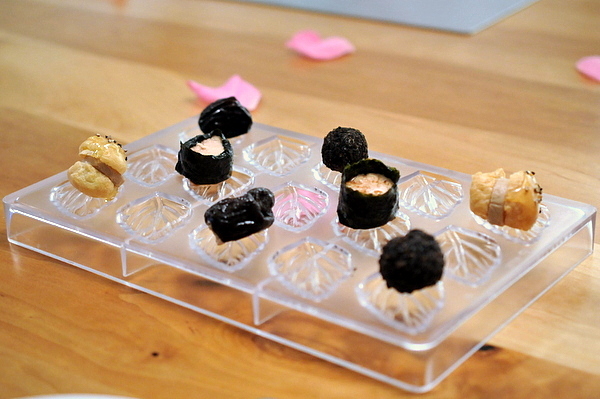 The last of the canapes consisted of tangy fruit infused with a vinous sweetness from the sauternes. 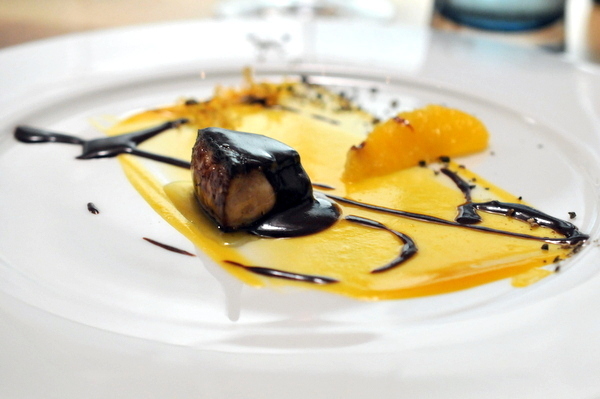 A dense core of chilled duck liver sits in the center and as it melts gives a sense of warmth to the apricot gelée. 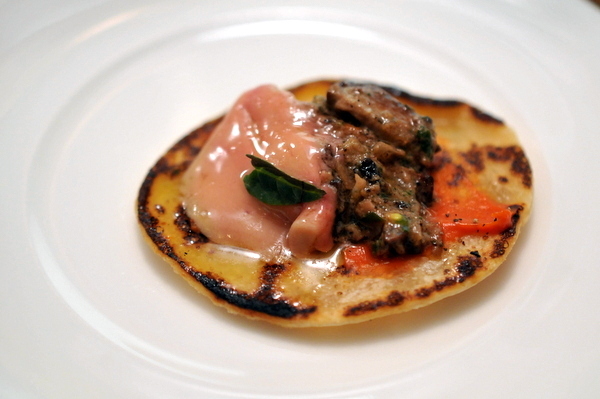 Somewhere between a pizza and a taco this bite was immensely satisfying yet unexpectedly light given the weight of raw and cooked foie. Instead a lovely yeasty char with restrained olive notes show through but enfolded a oily richness. Foie and brioche is a classic combination and though I enjoyed the svelte richness of the foie with the toasty bread, the liver wasn't actually the star. It was the captivating duet of floral rhubarb gelée and tart rhubarb compote that steal the show especially once combined with the bite of the black pepper. 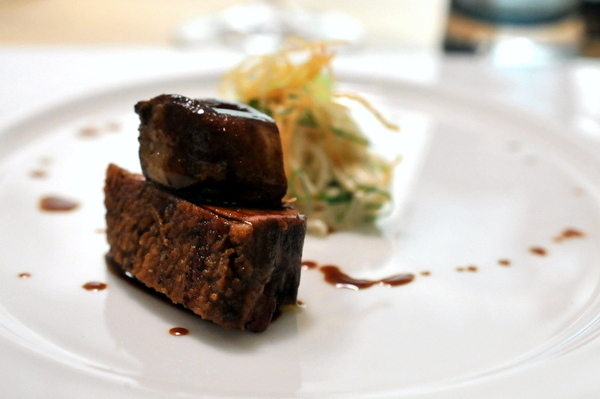 The minimalist smoked foie proved to be one of the most impressive dishes of the night. 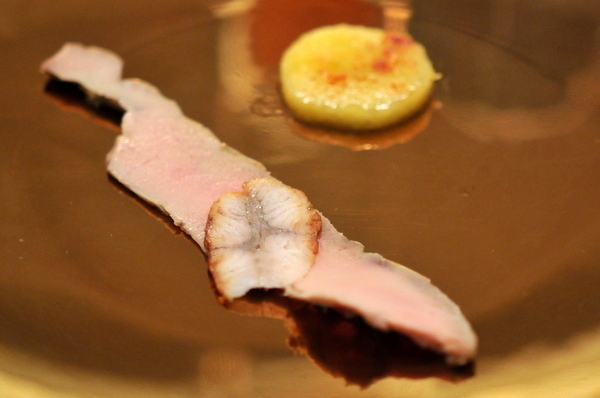 The thin sliver of liver exhibited a distinctly hammy essence that went beautifully with the saline of the eel and the juicy saccharine spice of the peach. 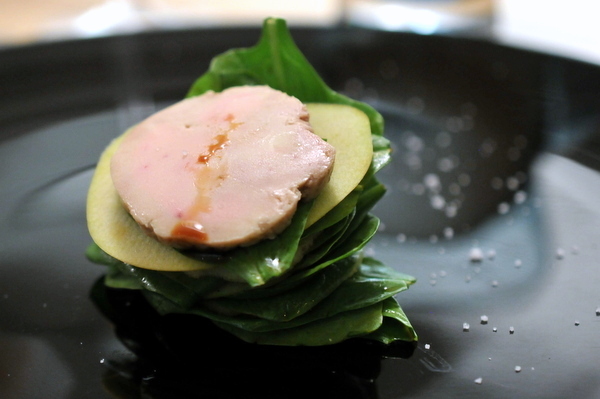 Layering complimentary elements of spinach and apple, this dish displays crisp levity and finesse despite the layer of foie on top. This straightforward preparation would have been impressive but it just lacked the requisite gravitas to follow the Salade Gourmande. Here we switched to an aromatic Alsatian Riesling, plenty of fruit with a touch of spice and acidity, the wine had a nice viscosity but wasn't overly sweet on the palate. 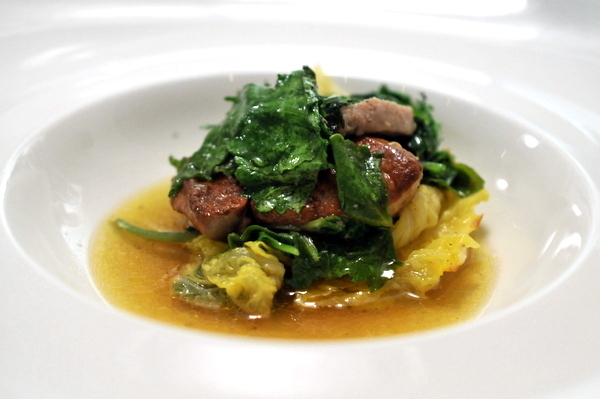 Easily one of the strongest courses of the night, this salad features not just one but three types of duck and in fact the liver is the least impressive of the trio when compared to the supple steely savor of the gizzard and the anise-kissed umami of the smoked breast. Not to be outdone, the crisp fresh vegetables bring a sense of bitter urgency to balance the savory profundity. 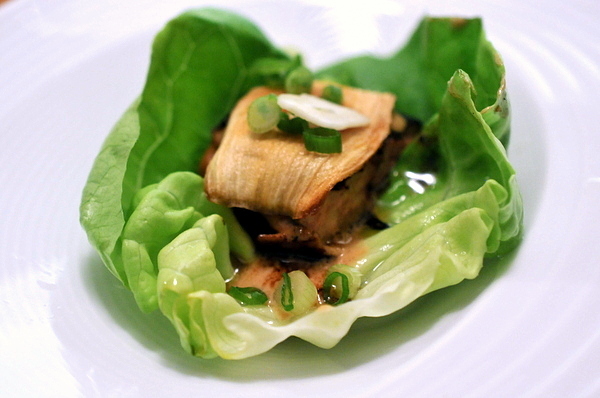 For this course, Feau drew on Korean barbeque for his inspiration. 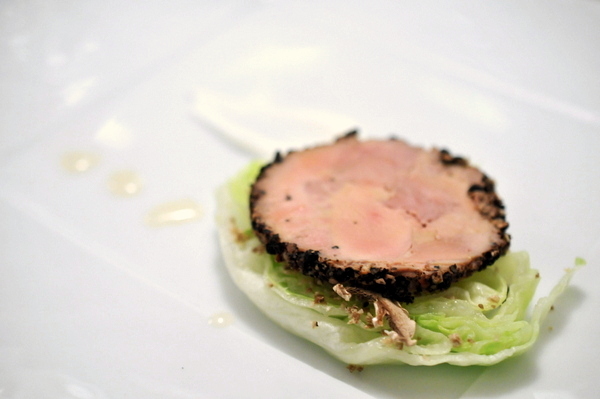 Basically a foie gras saam, the marinated liver is seared briefly on one side, giving it a charming charred rusticity while the lettuce again serves as a brake on the liver. 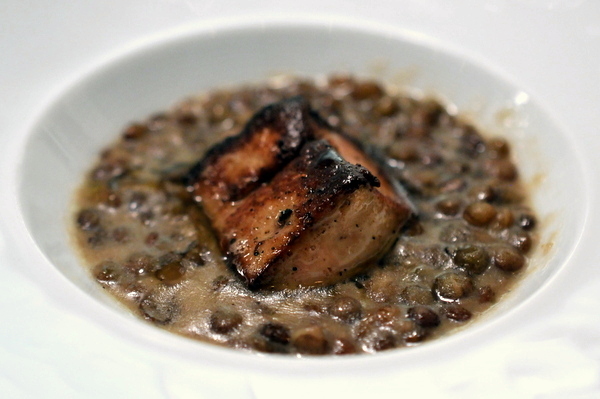 I've never really been a fan of lentils but Feau's preparations never fail to impress. Again we have the tender friable texture with just a tinge of earth. 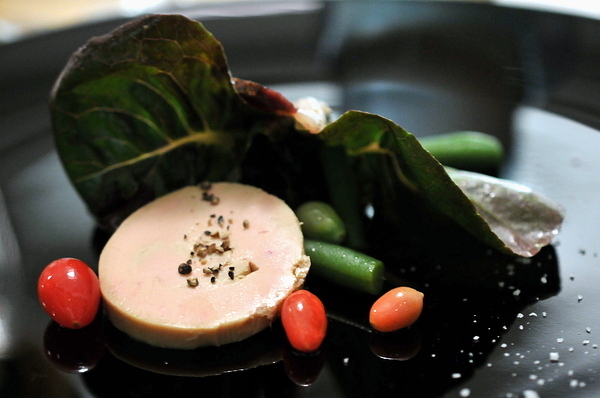 The foie comes through in the form of a heady savor that permeates the dish. I've started warming to Chardonnay and this was an example of everything I enjoy in this wine, the powerful notes of pineapple and lemon rind are balanced by equal amounts of flint and minerality. This turned out to be an immensely savory course instead of the foie and fruit that I was expecting. Turns out spelt berries are not really berries, but a type of grain which Feau has presented as a fine puree. Think creamy mashed potatoes with the caramelized fat essence of seared foie and a unique lingering herbaceousness from the papalo leaves. Aside from the foie gras bonbon, this was the only repeat of the night. Hot beef stock is poured over a bed of shaved foie gras and the immediately infusing the robust beefy stock with an extra layer of richness. 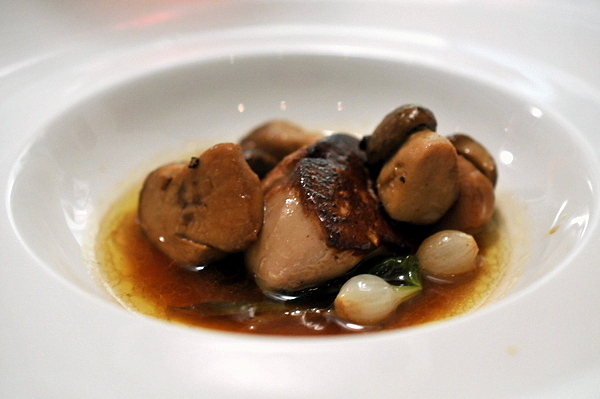 In a departure from the previous iteration, Feau replaces the chunk of foie gras with sliced mushrooms, a positive development that lets the herbal bouquet of the tarragon with the dry-aged beef shine through. Accompanying the tarragon, was a second pasta dish. 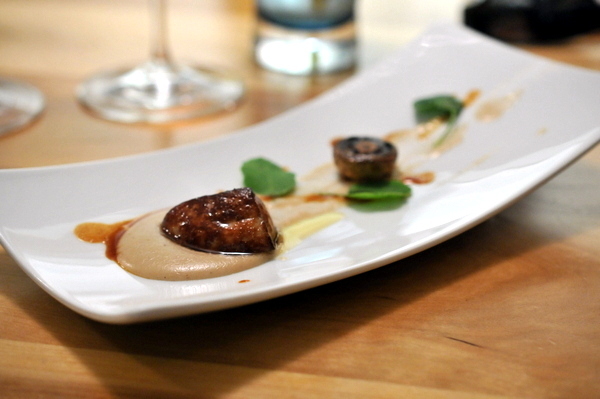 I feared this dish might be a bit too heavy, but the foie was actually fairly subdued with a hint of heady brown butter grounded by the stalwart earthiness of the morels and coffee. I think this dish called for a more delicate preparation of foie gras, maybe some shavings over the top to substitute for butter. 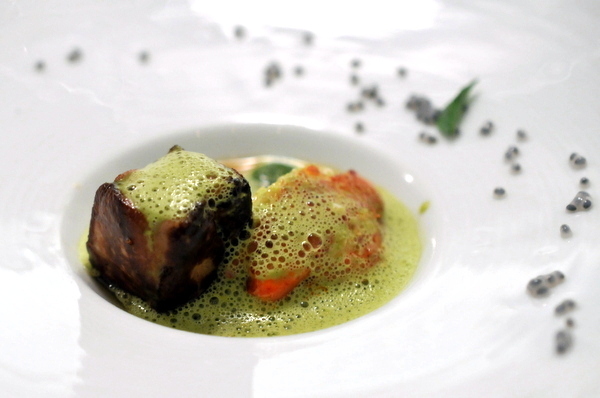 Even without the foie, the perfectly poached lobster paired beautifully with the verdant flavors of the favas and basil. Foie gras and pigs feet sounded like a daunting prospect at this point, but the meat proved to be surprisingly light like a tender gelatinous pulled pork. The stock still bore some of its vinous origins, providing the pork with a lovely fruity bouquet. 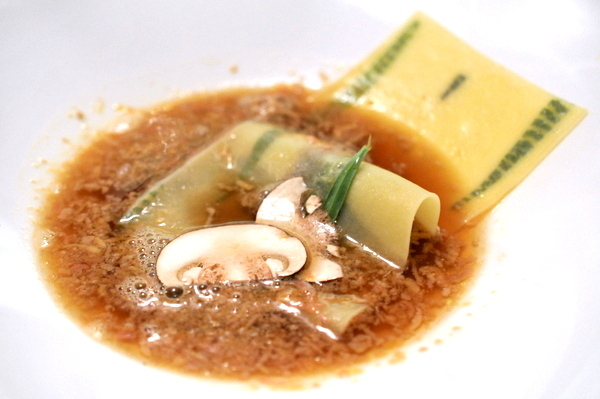 This might be the best consommé that I've ever had. 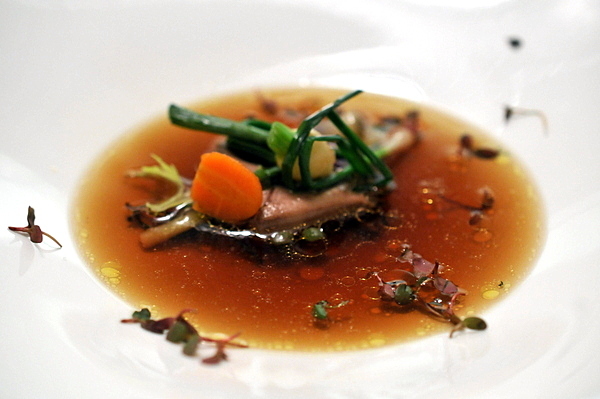 Something about consommé always leaves me craving more flavor but this had an intense savory twang that worked beautifully with the delicate vegetables. 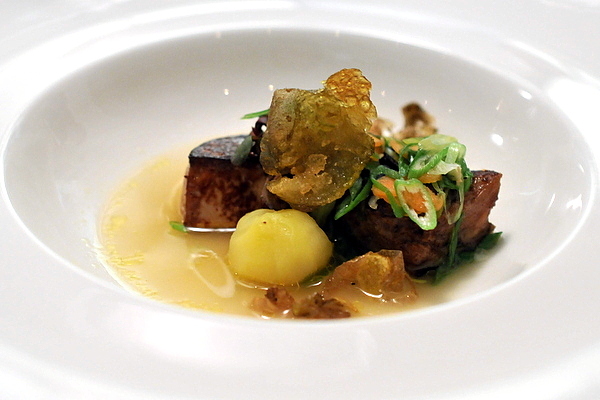 Again a lighter touch was needed with the liver, the poached foie felt a bit too jarring when paired with the clean soulful broth. FOIE GRAS | GARLIC SAUSAGE - seared foie gras, garlic sausage, ginger, kale and napa cabbage "en papillote"
Another Asian influenced dish, the entire mixture came cooked in parchment before being served table side. 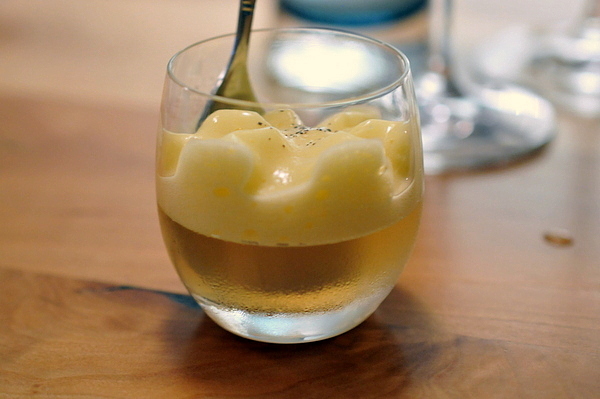 The flavor of duck fat and ginger in the broth gives this dish an oddly familiar comfort. The foie gras felt leaner than normal but I thought the subdued flavor and dense texture paired nicely with the porcine sapor of the sausage. Inside the pot sealed with dough was a mixture of foie gries with porcini and onion in a chicken stock that conjured up an image of foie gras pot pie. Dense and snappy, these were some of the the best porcini that I've ever eaten especially infused with the richness of the foie. Espuny noted this wasn't a particularly complex Burgundy but had plenty of sour cherry with a bit of game and herbs for balance. 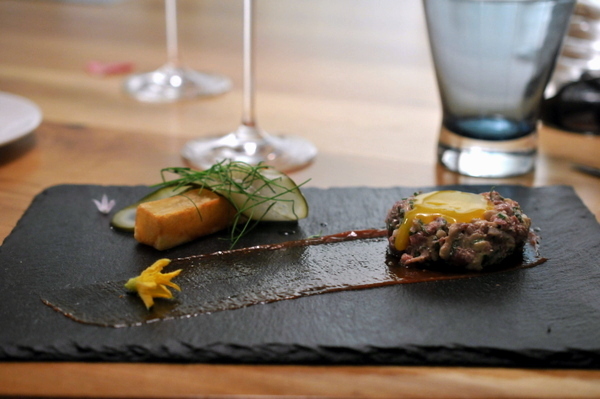 This was another contender for strongest dish of the night, a gentrified and modern interpretation of a classic steak tartare. The meal progressed from cold to hot foie but we ventured back to cold preparations for this course and it was a breath of fresh air. Hard to believe ground steak, raw egg, and fried potato could ever be described as light but that's how it felt after all that buttery hot foie. Here we have the two heaviest dishes of the night. I absolutely adored the dense baked squab particularly with the juicy bitterness of the turnip. The piece of leg felt overly salty but that could have been the result of palate fatigue. This was a bit of an unconventional take on a rossini with duck replacing the more common filet mignon. Again the dense muscular bird was spot on. The dollop of buttery foie gras was almost painful at this point, but the zip and bitterness of the celery remoulade helped balance things out. 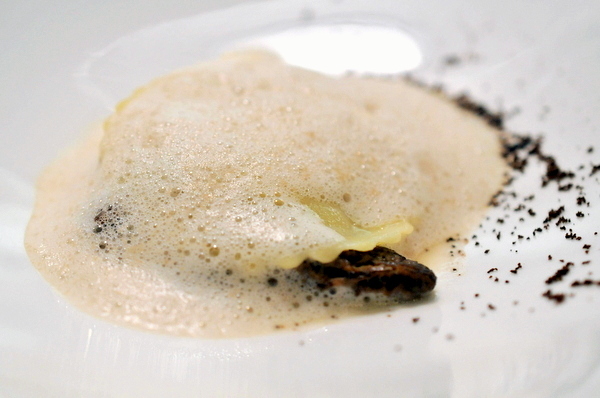 This dish reminded me of Guy Savoy's signature artichoke soup, no surprise considering Feau got his start working for the man. Though not a fan of artichokes, I found the thick potage with its smoky piquancy the perfect pick me up before transitioning to the sweeter dishes. 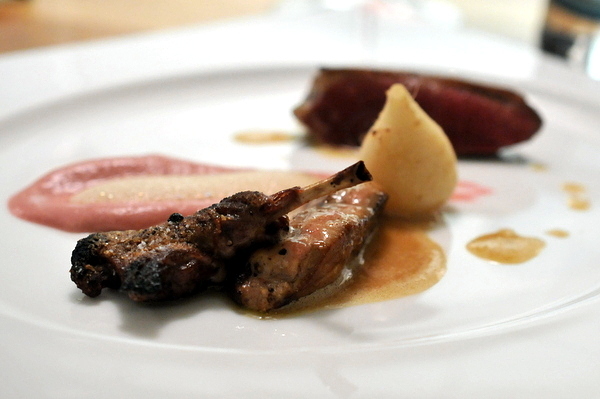 The foie was almost an afterthought here which worked perfectly for me. Like the soup, I'm happy the chef saved this course for the end. 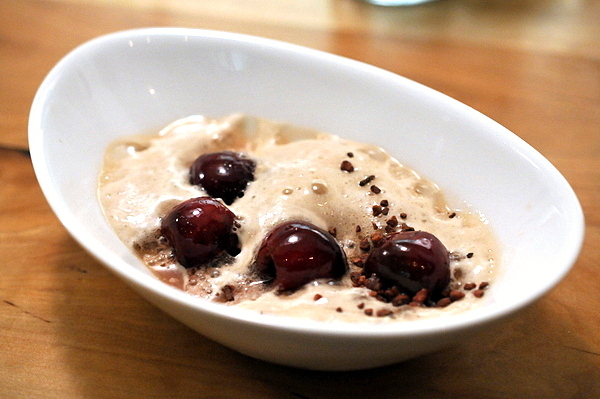 The buckwheat crêpe had a pleasing toastiness reminiscent of a rustic bread, perfect with the subdued buttery flavor of the foie gras custard. The tang of the grapes and zesty bite of the peppercress were the perfect foils for the livery heft. I really had a hard time with this course. 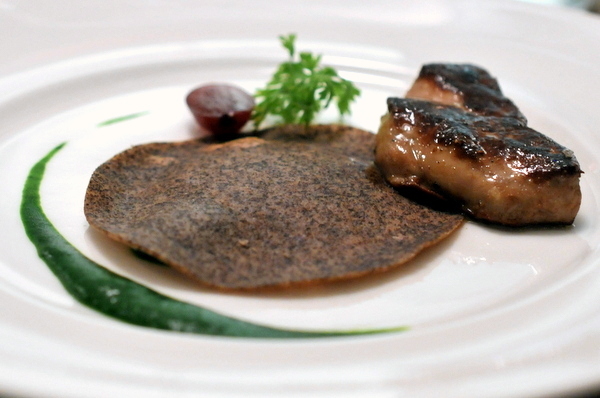 The mulberry, chervil, and chocolate just didn't do enough to counter the heft of the seared foie. This could have been a delicious tenth course but it was way to monolithic to be the twenty-sixth. Again the seared foie didn't do much for me with the chocolate but I did appreciate the classic combination of chocolate with orange particularly the way the tart juice helped wash down the oils from the liver. 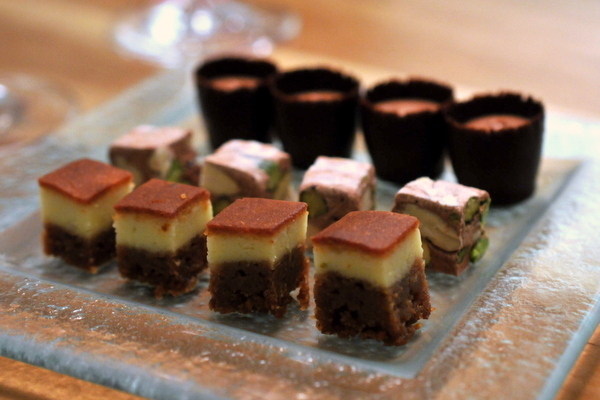 Here we have the only non-foie gras dishes of the night: a torta de queso, chocolate nougat, and chocolate pot de creme. Again the torta was my favorite of the three thanks to its balance between sweet and savory. I really liked the idea of a Coca Cola espuma but the interaction between the syrupy espuma and savory parfait just didn't work for me. 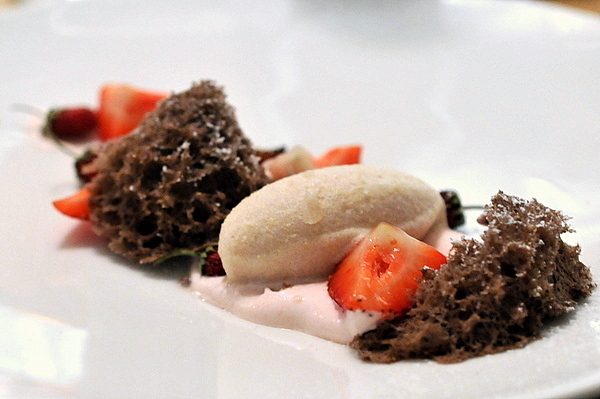 This dessert was more my style, a savory ice cream paired with the delightful perfume of fresh berries and an airy sesame cake, The result was a dessert that was full of flavor but that didn't feel heavy on the palate. During The Whole Duck dinner, Feau promised something special on the last day and he certainly delivered. I have to imagine that most chefs would have refused to serve a 30 course menu to 8 diners. So credit Chef Feau for stepping up and taking on this ambitious request at all to say nothing about how he knocked it out of the park. Ironically this overload of foie gras has done what no ban could ever do, quelling my desire for the stuff for at least a few months. With any luck the ban will be repealed just in time to sate my next craving. Completely ridiculous...I love it! 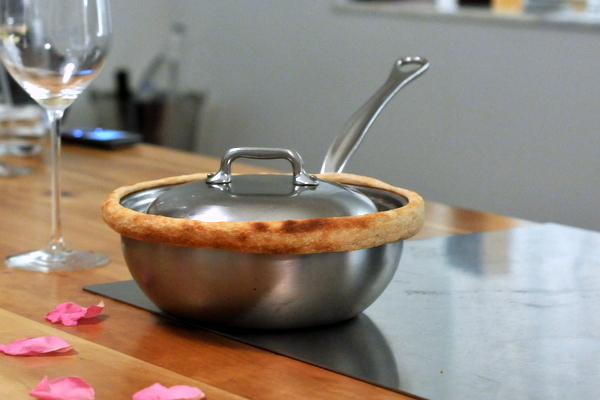 The porcini 'pot pie' one really struck me. Am I correct in saying, food-wise, this was cheaper than Melisse? $180 sounds like a heck of a deal when considering there were 30 frickin courses. Haha yeah it was way over the top, it was actually hard to eat everything. David really took care of us, $180 was an amazing price. 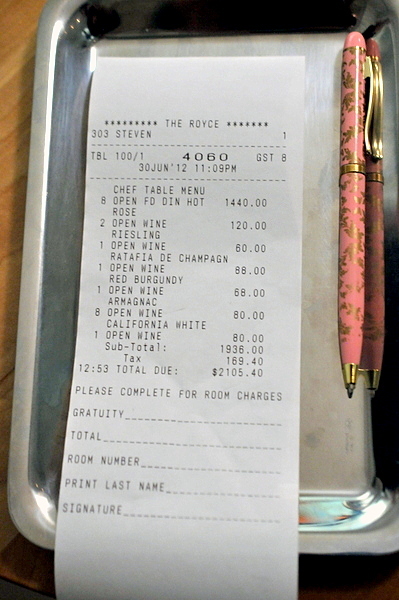 I think that was the cost for the regular tasting menu. Jesus Christ haha its making me feel full again just looking at the pictures! What an amazingly ridiculous meal. I'm was very happy to see that you covered this one. I'm even happier that you're still alive. Thanks Rod. You weren't the only one who was worried for my health.